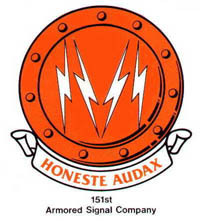 Badge: Upon an orange buckler two silver flashes chevronwise inverted between tow silver vertical flashes above a silver scroll with the motto: “Honeste audax” (Hororably Bold) in orange lettering. Description: The orange and white are the colors of the Signal Corps. The armored feature is indicated by the armed buckler, a form of medieval shield; the numerical designation is indicated by the flashes (IVI , or 151). Motto: “Honeste audax” (Honorably bold) is expressive of the characteristics of the personnel in the performance of their duties.